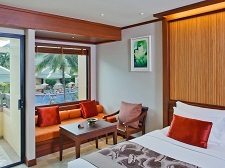 The Holiday Inn Phuket at Patong Beach is a beautiful resort and a great spot for fun family holidays or if your planning your very first vacation to the Island of Phuket. Patong Beach is like a magnet for first time visitors, and if you have decided to stay at Patong Beach, the Holiday Inn would definitely be a great choice. 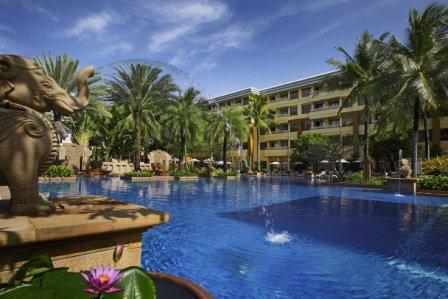 The resort is situated in an unbeatable location directly across the road from Patong Beach. The Holiday Inn at Patong Beach brings back some found memories of our first holiday to Phuket and the once quite, laid-back beach of Patong. 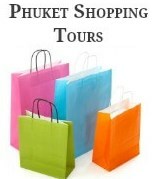 Since that first holiday the resort has undergone many changes but still remains at top spot for a holiday in Phuket. 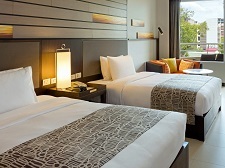 The Holiday Inn is centrally located with easy access to all that Patong has to offer. You will never be bored as the beach is located across the road and behind the resort you will find Otop markets, and Jungceylon Shopping Centre. There is a multitude of restaurants to choose from and all nightlife activities are all are within walking distance from the resort. Whilst Patong is extremely busy once you step inside the grounds of the Holiday Inn you will be surprised how quiet and tranquil it is. Within the landscaped grounds lies four swimming pools including a large kids activity pool with slides and fountains to keep the young ones entertained. The Holiday Inn Resort at Patong Beach is reasonably priced offering good value for money considering the fantastic location. You can check rates here. The Holiday Inn is like two separate resorts all in one ! 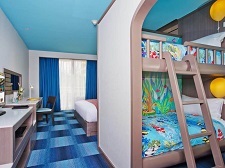 The rooms in the main wing are family friendly and are ideal for family vacations. 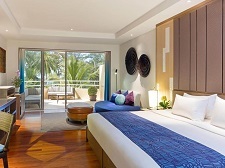 Within the main wing there is 258 rooms with a choice of rooms types available including Superior Rooms, Pool View Deluxe Rooms, Family Suites, Kids Suites and a Penthouse Suite. Within the Busakorn Wing there is 140 Studio and Villa rooms, comprising of Studio Pool View Rooms, Villa Pool View Rooms and Villa Pool Access Rooms. The Busakorn Wing is designed for romantic getaways. The Busakorn Wing has it's own private entrance and reception area including two swimming pools. If you choose to stay in the Busakorn Wing you also have the added benefit of accessing all the facilities in the Main Wing as well. 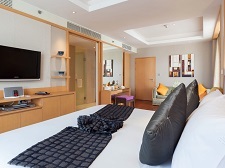 The Holiday Inn Phuket provides many comforts within the guest rooms, in the main wing you can expect the following in-room comforts during your stay. 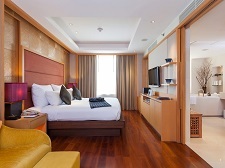 If you stay in one of the Holiday Inn, Busakorn Suites or Villas you will have the same in room comforts as the main wing rooms with some extra comforts including a complimentary mini bar. 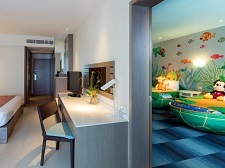 There are lots of fun activities for kids, with a kids club making the Holiday Inn a favourite spot for family holidays in Phuket. Like many hotels and resorts in Phuket the Holiday Inn Phuket offers many facilities but what they always do best is their friendly customer service. We also suggest that you read reviews from other travellers that have also stayed at the resort.